Chad Hansen serves as Chair of the Tax and Estate Planning Department of Coolidge Wall and practices in the areas of tax, business, and estate planning/probate. He advises individuals and closely-held businesses on various business transactions and tax issues, and provides advice on business formation, joint venturing, structuring acquisition and disposition transactions, and tax planning in relation to these transactions. He frequently helps clients structure the "comings" and "goings" of owners in business separations and restructurings, and addressing liquidity events. Chad works with business owners with business and personal succession issues so that a business owner's business and estate planning objectives are aligned. Chad has assisted a number of charitable organizations gain tax-exempt status or navigate tricky tax or organizational issues. He also represents clients in tax controversies with state and federal taxing authorities, including assisting clients in audits, protests, and tax collection matters. 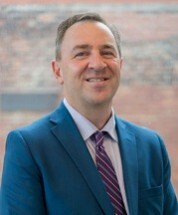 Chad's accomplishments include being listed in The Best Lawyers in America® (2016-2019) and being named the 2019 "Lawyer of the Year" in Tax Law in Dayton. Only 4% of attorneys in the country receive Best Lawyers recognition. Chad also has been a frequent writer and speaker on various tax and business topics and taught business law and income tax courses as an adjunct professor at Antioch University and Franklin University. Outside of work, Chad enjoys watching various sporting activities, kayaking, racquetball, and spending time with his wife and three sons.